HP is pushing into an entirely new direction that it hopes will revive the company’s slumping fortunes. The personal computer and printing giant said on Tuesday that it plans to sell two 3D printers for business customers to create prototypes and larger batches of items like small clamps for controlling the amount of liquid flowing through hoses. 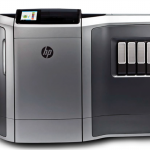 Unlike many of the 3D printers available from startups like Formlabs and MakerBot, HP is not targeting consumers. Instead it is betting on the industrial market that it hopes has a bigger appetite for pricy 3D printing equipment. The company’s lower end HP Jet Fusion 3D 3200 printer will sell for $130,000, or $155,000 if customers want extra post-processing software and other tools. The HP Jet Fusion 3D 4200 model, which can be used to print 3D objects in bulk, will retail for over $200,000 depending on configuration, HP said. HP’s sales have been steadily declining over the years as the market for its core products—personal computers and standard printers—has shrunk. The company has been banking on 3D printing reviving the company, which last year split from its data center and business software specialist sibling. Posted in HP. Bookmark the permalink.